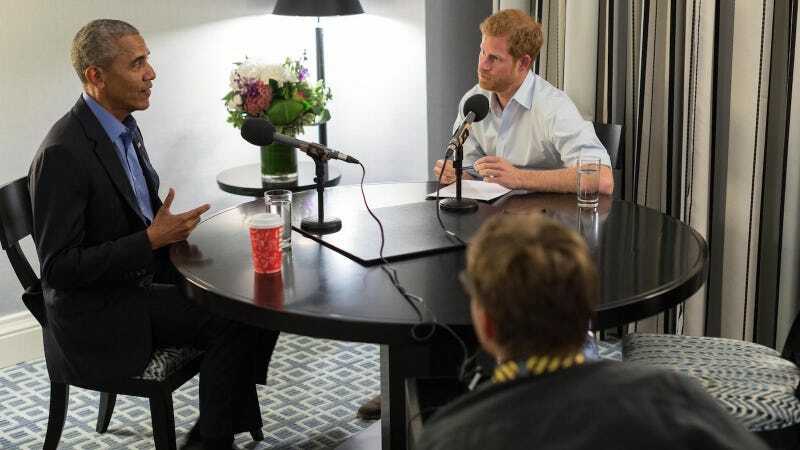 Former President Obama was interviewed on BBC Radio 4 by his friend Prince Harry, where he delivered a series of thoughtful, diplomatic statements about the political dangers of social media “cocoons,” the pressures of public life, his marriage, and the inauguration of his successor, an orange dump truck who quoted Bane in his inaugural speech. That was actually fine, Obama insisted. “The first thing that went through my mind was sitting across from Michelle, how thankful I was that she had been my partner through that whole process,” Obama said, when Harry asked what was running through his mind on January 20 as Donald J. Trump officially took his place as the leader of the free world. The former First Lady, Obama added, had been a reluctant participant in the political process, and he was thinking about how lucky he was that their partnership had made it through his presidency intact. Fair enough. You know what, again—fine. Particularly within the delicate context of an interview with Prince Harry, a member of the politically neutral British royal family, it is fully within Obama’s rights to be infuriatingly circumspect. Relations between the UK and the US aren’t exactly fabulous right now, and there is also reportedly some concern that Trump will feel “snubbed” if Harry invites the Obamas to his upcoming nuptials, so it’s not like the moment was ripe for Getting Real. But come on. Serenity, bro? At the sight of a Führer-inspired con man with a rapidly deteriorating capacity to speak in full sentences obtaining access to nuclear weapons and explicitly promising to piss on your legacy?